Heat oven to 425°F. Remove the seeds from one medium acorn squash, and cut the squash into slices that are ¾-inch thick. Finely chop 1 bunch mint; set aside. On large baking sheet, toss squash slices with 1 tablespoon olive oil, ½ teaspoon kosher salt and a pinch cayenne. Roast until golden brown and tender, 20 to 25 minutes. Meanwhile, heat 1 tablespoon olive oil in a large skillet over medium-high heat. Season 4 6-ounce boneless, skinless chicken breasts with ½ teaspoon kosher salt and ¼ teaspoon black pepper. Add to skillet and cook until golden brown and cooked through, 6 to 8 minutes per side. Remove the chicken from pan and set aside. Return the skillet to medium heat and add 1/3 cup pomegranate juice, and cook scraping up any brown bits for 1 minute. Add ¼ cup honey and 1 tablespoon balsamic vinegar and cook until thick and syrupy, 3 to 5 minutes. Brush the chicken with the glaze. 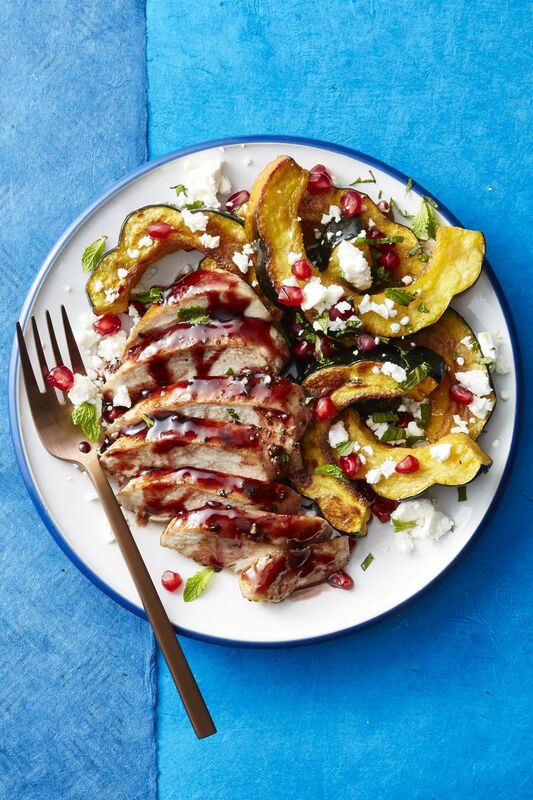 Sprinkle squash with 1/3 cup each crumbled feta and pomegranate seeds and the chopped mint before serving. In a large bowl, toss Brussels sprouts, separating leaves into strands. Stir in apple and next 3 ingredients. Fold in 1/2 to 3/4 cups vinaigrette. Season with salt and pepper to taste; let stand 5 minutes or cover and chill 2 hours. Transfer to a serving dish and sprinkle with cheese. Serve with remaining vinaigrette. Sherry Vinaigrette: Whisk together sherry vinegar, shallot, honey, and whole-grain Dijon mustard. Let stand 5 minutes. Whisk in olive oil. Season with salt and pepper to taste. Makes 1 cup. 6 tbsp. butter, at room temp. Heat oven to 425°F. With vegetable peeler, remove 6 strips lemon zest, avoiding white pith; thinly slice crosswise. In small bowl, combine butter, garlic, mustard, lemon zest and 1/2 teaspoon each salt and pepper; set aside. Remove skin from turkey-breast halves and set aside. Rub butter mixture all over turkey breasts. Place one breast half on top of the other, arranging so 1 thick side and 1 thin side are sandwiched together. Wrap breasts in skin and tie with butcher's twine to form log shape. On large rimmed baking sheet, toss shallots with oil and 1/4 teaspoon each salt and pepper. Arrange them in center of sheet and place turkey on top. Roast 60 minutes. Remove from oven and transfer turkey to cutting board. Add potatoes, carrots and parsnips to baking sheet and toss with shallots and 1/2 teaspoon each salt and pepper; arrange in even layer. 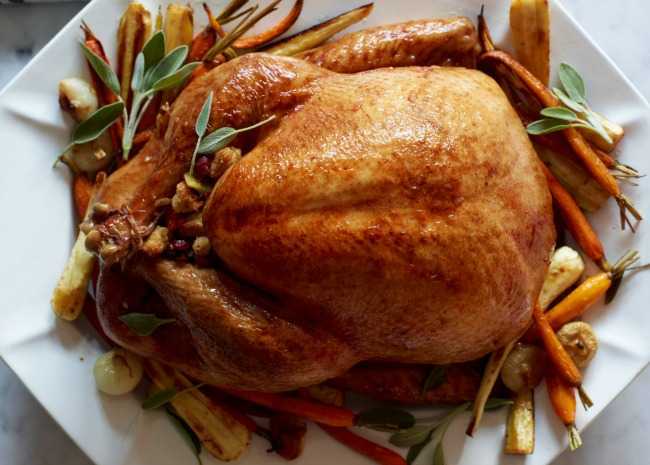 Place turkey on top of vegetables and roast until turkey registers 165°F on instant-read thermometer and vegetables are golden brown and tender, 35 to 45 minutes more (remove vegetables that are done before turkey). Transfer turkey to clean cutting board and let rest at least 10 minutes before slicing. Serve with pan juices and vegetables. Nutrition info (per serving): About 535 calories, 48g protein, 30g carbohydrates, 24g fat (9g saturated), 6g fiber, 560mg sodium. Add the chocolate chips to a microwave-safe bowl, and microwave on HIGH for 20-second intervals, stirring well between each, until the chocolate is melted. (Mine took 3-4 pulses.) Let the chocolate cool for 5 minutes. Gently fold in the yogurt. Refrigerate for at least 25 minutes, or until it firms up but is still shapeable. Add the cocoa powder to a small bowl, and line a small baking sheet with wax paper. Remove the chocolate mixture from the refrigerator. Working with a teaspoon of the chocolate mixture at a time, shape into a ball and roll in the cocoa powder. Place onto the prepared baking sheet. Repeat with the remaining chocolate mixture, and refrigerate until ready to serve. Line an 8”-square baking pan with foil, and lightly coat with nonstick cooking spray. Set aside. Remove from the heat and the burner, and allow the hot mixture to sit undisturbed for 6 minutes. After 6 minutes, stir vigorously until the mixture becomes thick and creamy and lightens in color. Spread into the prepared pan, and allow the fudge to cool to room temperature before slicing into 1” squares.